A paucity in the medical literature exists illustrating critical examination of the injury, treatment protocol, and outcomes. In 1939, Wilson, Michele, and Jacobsen discussed ankle dislocations without fracture but were limited to 2 private patient case studies and only 14 cases that had been previously reported since 1913. It was this study that attempted a literature review, evaluation of the mechanism, treatment, and results. Again, in 1991, further lack of ankle dislocation research prompted Moehring et al to compile one of the larger series of open ankle dislocation. Recently, most literature demonstrates isolated cases studies of pediatric and adult tibiotalar/ankle dislocations. The ankle joint is designed for a balance of stability and flexibility, particularly the former. Joint stability is provided by close articulation of the talus with the tibia and fibula. The mortise design further enhances the stability of the configuration. During normal walking, the ankle joint bears 3-5 times the body's weight. This factor increases several fold during running and jumping activities. As weight is applied on heel strike, the fibula descends to increase stability of the ankle joint. 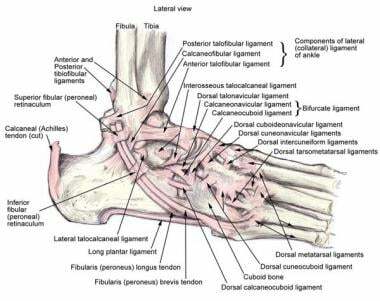 Anatomy of the lateral ankle ligamentous complex and related structures. Children and adolescents have the most ankle dislocations. Dislocations of the ankle are seen more frequently in young males than in any other group. This presumably is related to their increased risk overall for traumatic injury. Postmenopausal women are at higher risk for associated fractures. Increased fracture risk probably is related to osteoporotic changes in this subset of patients. Dislocated ankles should not be expected to return to premorbid function. The amount of force and level of capsular disruption required to dislocate the inherently stable joint results in significant injury with lasting effects. To a limited extent, prompt intervention can reduce the risk of complications. Thangarajah T, Giotakis N, Matovu E. Bilateral ankle dislocation without malleolar fracture. J Foot Ankle Surg. 2008 Sep-Oct. 47(5):441-6. [Medline]. Wilson M, Michele A, Jacobsen E. Ankle dislocations without fracture. JBJS. January 1939. 21:198-204. Moehring HD, Tan RT, Marder RA, Lian G. Ankle dislocation. J Orthop Trauma. 1994. 8(2):167-72. [Medline]. Tarantino U, Cannata G, Gasbarra E, Bondi L, Celi M, Iundusi R. Open medial dislocation of the ankle without fracture. J Bone Joint Surg Br. 2008 Oct. 90(10):1382-4. [Medline]. Karampinas PK, Kavroudakis E, Polyzois V, Vlamis J, Pneumaticos S. Open talar dislocations without associated fractures. Foot Ankle Surg. 2014 Jun. 20(2):100-4. [Medline]. Graeme KA, Jackimczyk KC. The extremities and spine. Emerg Med Clin North Am. 1997 May. 15(2):365-79. [Medline]. Kim DI, Kim YS, Han SH. Topography of human ankle joint: focused on posterior tibial artery and tibial nerve. Anat Cell Biol. 2015 Jun. 48 (2):130-7. [Medline]. JT Southerland. McGlamry's Comprehensive Textbook of Foot and Ankle Surgery. 4th Ed. Lippincott Williams & Wilkins; 2013. Weston JT, Liu X, Wandtke ME, Liu J, Ebraheim NE. A systematic review of total dislocation of the talus. Orthop Surg. 2015 May. 7 (2):97-101. [Medline]. Lübbeke A, Salvo D, Stern R, Hoffmeyer P, Holzer N, Assal M. Risk factors for post-traumatic osteoarthritis of the ankle: an eighteen year follow-up study. Int Orthop. 2012 Jan 17. [Medline]. Soneji N, Peng PW. Ultrasound-Guided Interventional Procedures in Pain Medicine: A Review of Anatomy, Sonoanatomy, and Procedures: Part VI: Ankle Joint. Reg Anesth Pain Med. 2016 Jan-Feb. 41 (1):99-116. [Medline]. Ross A, Catanzariti AR, Mendicino RW. The hematoma block: a simple, effective technique for closed reduction of ankle fracture dislocations. J Foot Ankle Surg. 2011 Jul-Aug. 50(4):507-9. [Medline]. Grotz MR, Alpantaki K, Kagda FH, Papacostidis C, Barron D, Giannoudis PV. Open tibiotalar dislocation without associated fracture in a 7-year-old girl. Am J Orthop (Belle Mead NJ). 2008 Jun. 37(6):E116-8. [Medline]. Heyworth J. Ottawa ankle rules for the injured ankle. Br J Sports Med. 2003 Jun. 37 (3):194. [Medline]. [Full Text]. Stiell IG, Greenberg GH, McKnight RD, Nair RC, McDowell I, Reardon M, et al. Decision rules for the use of radiography in acute ankle injuries. Refinement and prospective validation. JAMA. 1993 Mar 3. 269 (9):1127-32. [Medline]. [Guideline] Mosher TJ, Kransdorf MJ, Adler R, Appel M, Beaman FD, Bernard SA, et al. ACR Appropriateness Criteria acute trauma to the ankle. J Am Coll Radiol. 2015 Mar. 12 (3):221-7. [Medline]. Agrawal AC, Raza H, Haq R. Closed posterior dislocation of the ankle without fracture. Indian J Orthop. 2008 Jul. 42(3):360-2. [Medline]. [Full Text]. Camarda L, Martorana U, D'Arienzo M. Posterior subtalar dislocation. Orthopedics. 2009 Jul. 32(7):530. [Medline]. Daffner RH. Ankle trauma. Semin Roentgenol. 1994 Apr. 29(2):134-51. [Medline]. Dean DB. Field management of displaced ankle fractures: techniques for successful reduction. Wilderness Environ Med. 2009 Spring. 20(1):57-60. [Medline]. Distefano S, Divita G. A case of pure dislocation of the ankle joint. Ital J Orthop Traumatol. 1988 Mar. 14(1):133-7. [Medline]. Finkemeier C, Engebretsen L, Gannon J. Tibial-talar dislocation without fracture: treatment principles and outcome. Knee Surg Sports Traumatol Arthrosc. 1995. 3(1):47-9. [Medline]. Greenbaum MA, Pupp GR. Ankle dislocation without fracture: an unusual case report. J Foot Surg. 1992 May-Jun. 31(3):238-40. [Medline]. Griffiths HJ. Trauma to the ankle and foot. Crit Rev Diagn Imaging. 1986. 26(1):45-105. [Medline]. Krishnamurthy S, Schultz RJ. Pure posteromedial dislocation of the ankle joint. A case report. Clin Orthop Relat Res. 1985 Dec. (201):68-70. [Medline]. Merianos P, Papagiannakos K, Hatzis A, Tsafantakis E. Peritalar dislocation: a follow-up report of 21 cases. Injury. 1988 Nov. 19(6):439-42. [Medline]. Mooney JF, Naylor PT, Poehling GG. Anterolateral ankle dislocation without fracture. South Med J. 1991 Feb. 84(2):244-7. [Medline]. Schuberth JM. Diagnosis of ankle injuries: the essentials. J Foot Ankle Surg. 1994 Mar-Apr. 33(2):214. [Medline]. Wehner J, Lorenz M. Lateral ankle dislocation without fracture. J Orthop Trauma. 1990. 4(3):362-5. [Medline]. Wilson AB, Toriello EA. Lateral rotatory dislocation of the ankle without fracture. J Orthop Trauma. 1991. 5(1):93-5. [Medline]. Wroble RR, Nepola JV, Malvitz TA. Ankle dislocation without fracture. Foot Ankle. 1988 Oct. 9(2):64-74. [Medline].